Topic: Not if but when! Re: Not if but when! This isn't quite the maiden voyage, but its just now getting de-bugged good and the family is enjoying the boat. Topic: Hello guys this AF4 GRANDE has been a long time coming. Re: Hello guys this AF4 GRANDE has been a long time coming. Got the jet drive running will post in maiden voyage or launch if I can find it. Did a leak test and checked that off. Powered up the river a little with the 6hp johnson trolling motor, draft was about 2.25" I believe that 10hp would've planned the boat out. I really liked it. Now to get the main power working and mount that trolling motor and get juice to it. Looks great, I'm right behind you, took me a year and 2 months so far. Tell me how it feels on the water that first time. I can't wait. 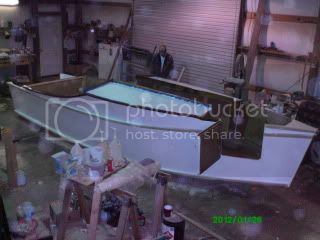 Weighed in at 760 lbs bare hull, she should float and run shallow as intended with the 22' length and almost 6' beam! Woo hoo! Working on filleting and sealing the inside. I'm looking for small oval port windows but wouldn't be opposed to round. They'll be in a curved portion of the boat so smaller will be easier to make a flat place for. All sources I find are 18" long or longer. Does anyone know of a wide selection port window source? Well it should be water worthy now that its externally sealed. Now to UV protect the Black Cherry Trim work, then prime and paint the ply. Hopefully while my little brother Urethanes the trim I'll get the inside ready to do.